A Frog in My Throat..or...Un Chat Dans La Gorge! : Party Time! OK...as freelance VO talent, we are very often sitting in our own studios...our own "padded rooms" if you will. So whenever we get a chance to get together & have some fun as a community, we jump at the chance! 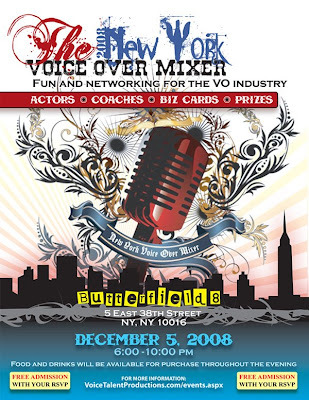 One such chance is coming up on December 5th in NYC, put together by my friend Erik Sheppard of Voice Talent Productions! If you are, remember to say "Hi!" Thanks for the press Liz. The guest list on the site is being updated as people are replying so you can always check back to see who else is coming. This may be kind of overkill because if Liz and I are going to be there, who cares who else will be? I really want to be there for this because it looks like it will be blast. My fingers are crossed that I may finally meet Liz in person.